Archives : NORTHWARD JOURNEY CONTINUES - 01/10/2010. NORTHWARD JOURNEY CONTINUES - 01/10/2010. NO STOPPING THE LIQUIDITY FLOW. Bulls are flying high on the back of unexpectedly high FII inflows and there is no stopping the liquidity flow. The liquidity tap has been left opened and the obscene amount of money will continue to find its way in our market as India continues its northward journey. What has taken the market participants by surprise is not the magnitude of rise but the rate at which the market is increasing. Very few might have accounted for such a stupendous rise of the market. In a classical case of disbelief and being caught on the wrong foot, the bears are now trapped and are living on a prayer and hope. This fact is highlighted by the fact that the Nifty futures rollover was lesser as compared to previous month, which means short Nifty positions got rolled over to this month. The one way upmove will continue as long as shorts continue to remain in the system. Certain oscillators like the RSI continues to remain in overbought territory, but let me once again warn, at the cost of sounding repetitive, that the oscillators can remain there for days and weeks together. The Sensex opened the week at 20082, made a high of 20475, a low of 19864 and closed the week at 20445. The Sensex gained an astonishing 400 points on a weekly basis. Similarly Nifty opened the week at 6018, made a high of 6153, a low of 5963 and closed the week at 6143. The Nifty too closed with the week with a solid gain of 125 points. On the weekly charts both Sensex and Nifty have formed a Closing White body Marubuzo. This is a Bullish candlestick pattern which comes on the heels of last three weeks candle pattern formation in the form of Three White Soldiers. The bullish implications of this formation will be seen once again in the next week. On Friday, as per the daily charts, both the indices have formed a Bullish White body Marubuzo, suggesting that the bull strength is intact and which will be seen in full flow in the coming week. 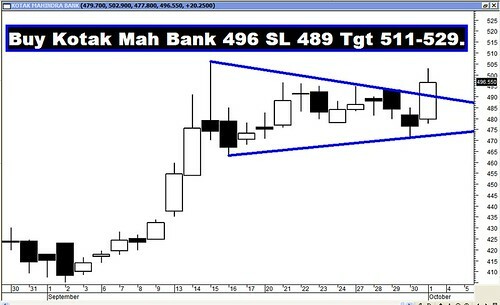 Since last October, the market is moving in a Rising Channel and the channel top had provided strong resistance to the market and that supply trendline top was breached and as a result both the indices have closed above their respective Trendline tops and hence a bullish breakout is in place. Due to this Rising Channel Breakout, the target for the Sensex will be at 20627 and Nifty 6180. Let us consider the Bullish Inverted Head and Shoulders formed on the weekly charts. Sensex fell from 15579 in Aug 08 to 7697 in Oct 08. The target for this fall is at Sensex 23461. 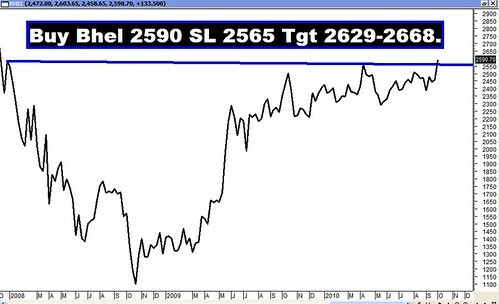 Similarly Nifty fell from 4649 in Aug 08 to 2252 in Oct 08 and the target for this fall is at Nifty 7046. In the current upmove both the indices have rebounded from Sensex 17819 and Nifty 5348 and in the process have registered higher bottoms. Sensex has formed higher bottoms at 17819-17373 and Nifty has formed higher bottoms at 5348-5210. The uptrend will be in danger only if both the indices close below their higher bottoms i.e. Sensex – 17819 and Nifty – 5348. On the moving averages front, both the indices are well above their 20dma (Sensex – 19520 and Nifty – 5861) and 50dma (Sensex – 18695 and Nifty – 5614) hence the short and medium term trend are positive. Majority of the oscillators are showing strength and continue in Buy mode. MACD and ROC continue with their Buy signals besides being in positive territory. The Stochastic oscillator is no more in overbought territory and has just given a buy signal. The momentum oscillator like the RSI (78) continues to remain in overbought territory since 9th September 2010. Here one needs to remember that the market may or can remain in overbought territory for days together. Also the momentum is the highest when in overbought zone. The ADX has increased and is currently at 50 which indicate that the current trend is gaining strong momentum and the trend is now maturing. The Directional Indicators are already in Buy mode. The MFI is in Buy mode and so is the OBV. The OI PCR at 1.54 suggests that the bulls are more likely to see further upside to the market. The Call writers have lost confidence and Put writing is gaining currency. For the current month, strong build up is seen at the 6000 Put which should act as a near term support. Some Call writing is seen at the strike of 6200 which will provide short term resistance to the market. LAST WEEKS RECOMMENDATIONS: Majority of the recommendations did well except for Aban which went into a ban period. Now since it is out of the ban period, expect the targets to be achieved with ease. The star performers for the week were LIC Housing and Jindal S-W which increased by a whopping 10% and 9% respectively.